Sardinia was part of the Aragon Crown until the Spanish war of Succession. Still, the presence of the Verge de Montserrat in Alghero does not date back to this historical episode and must be situated at the middle of the XXth century. The first “rediscovery” of Alghero by the Catalan intellectual community took place at the end of the 19th century, through the figure of Eduard Toda (Un poble català d'Itàlia: l'Alguer, 1888). During the civil war, Alghero became one of the few Catalan-speaking places that had not been occupied by the Franco regime. 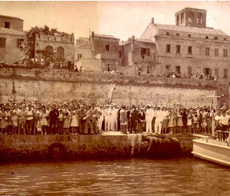 In August of 1960, more than one hundred intellectuals and representatives of Catalan civil society sailed to the coasts of Alghero, where thousands of Alghero dwellers awaited them; it was one of the most relevant events in the history of Catalanism under the Franco regime. The Catalans had with them an 82cm Moreneta, which had been carried on foot from the monastery of Montserrat and kept for three days in the Mercè church (Barcelona). Its journey came to an end at the Alghero Cathedral. The virgin’s journey from the principality to Sardinia was accompanied, therefore, by a social ritual and a marked political objective. The symbolism of this event afforded the virgin a connotation of resistance and protector of the linguistic unity between territories. A year later, Alghero held the Jocs Florals of 1961. 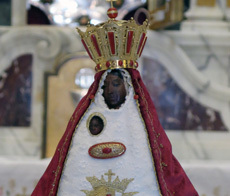 The analysis of La Moreneta cannot be separated from the study of another black virgin: the Mother of God of Vallverd. The latter is a divinity from Alghero, and as such, the citizens are very devoted to her. 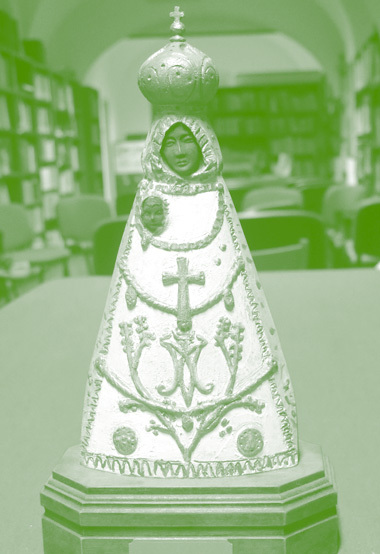 The arrival of La Moreneta did not lead to a replacement but rather a coexistence of the two figures. La Moreneta is in the Alghero Cathedral, in the centre of the city. Vallverd remains in the countryside, recalling the pastoral nature of the Sardinian culture. 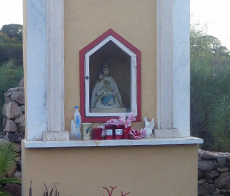 The relation between both images reached its most decisive point in 2002 when the government of Alghero offered a copy of the icon of Our Lady of Vallverd to the Montserrat Abbey (Catalonia).